Are you looking for a new home in one of Austin’s many master-planned communities? As a Broker/REALTOR® and Owner of Goodwin & Goodwin Real Estate, I can help you find a home that’s best suited to your lifestyle. Whether you’re looking for quick access to riding stables, great golfing and tennis, or sipping wine on your patio, one of the following three communities may be right for you. Want a competitively-priced home with contemporary style, easy access to Austin’s airport and stables close by? The Hills of Bear Creek could be the answer. You’ll find homes priced from $300K-$400K. Moreover, property taxes are lower than in Austin. This is an 85 home community built by Milestone. It’s located South of Austin in Manchaca, pronounced “man-shack” by locals. Manchaca is about 16 miles from downtown Austin and features great BBQ at Valentino’s. If you’re looking for more of a luxury lifestyle experience and access to the Texas Hill Country, The Enclave at Covered Bridge could be a good choice. The community is located on 290 West which is just a few miles away from the Texas Hill Country. It’s about 25 minutes from downtown Austin. Homes generally start at $450K. I give a big thumbs-up to the builder (Brohn homes) for preserving 18 heritage trees. Additionally, Brohn endeavors to create great Hill Country views and support the natural surroundings. Does a lake-living resort-lifestyle appeal to you? If so, the Rough Hollow Community on Lake Travis may be the answer. Rough Hollow is a large luxury community built along a cove of Lake Travis with six distinct sections. If you love being active, you’ll have lots of choices to do so here. Highland Village is the community’s private yacht club, water park and more. Additionally, if you love sipping a glass of wine at sunset you’ll find wonderful vistas here. Rough Hollow also feeds into the award-winning Lake Travis School District. I am impressed with Brookfield Builder’s commitment to their core values of passion, integrity, and community which is the foundation for a great community. In Conclusion: When working with me as your Broker/REALTOR®, you can expect me to listen carefully to your priorities and show you the best homes for your lifestyle so you can enjoy your home for years to come! Want to see one of these communities or others? I’m ready to help you today! I remember when this neighborhood got started back in 2006 by Carter Bruce Homes. It had a slow start, like many new construction neighborhoods, but now that it’s completely built out, it looks very nice and is surrounded by lots of new development in the Lake Travis Area. The Yaupon Creek neighborhood is a smaller neighborhood with just over 30 homes which feed into Lakeway Elementary, Hudson Bend MS and Lake Travis HS. Right now there’s a house for sale at 203 Rivulet Lane, priced at $374,900. The home was built in 2010, has 4 bedrooms, 3 baths, and .31 acre lot backing to a greenbelt. It also has bamboo flooring, an open floor plan and a courtyard entry. 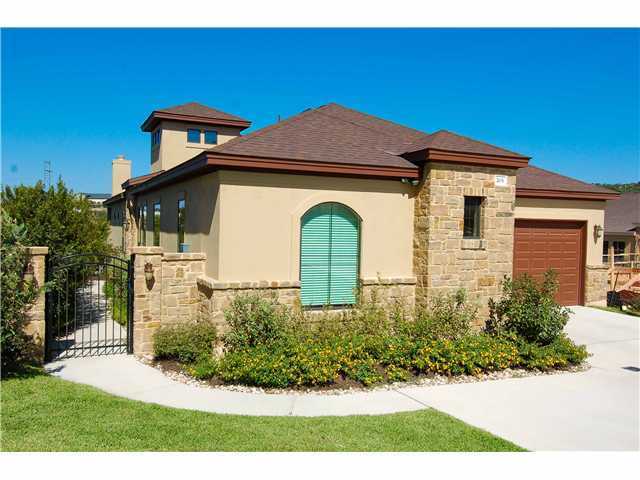 I like the location – close to RR620 and Lohman’s Crossing, you can be on 620 in just a minute. I also like the stone and stucco exteriors and just the feel of the smaller neighborhood that is now complete. And finally, it’s just a minute from the library, which I like since I love to read! By now, most of us have come to the conclusion that just because a home is in foreclosure, it is not necessarily going to be priced below market. There is just no consistency when it comes to the pricing on foreclosures. I came across a foreclosure in Lakeway yesterday, and decided to check on it’s pricing. The home, located at 103 Snapper, is priced at $294,900. It looks ok in the photos – although the dead lawn doesn’t help. The price comes out to $132/sq ft for 2234 sq ft. As it turns out, this is an above average price for Lakeway, where the average $/sq ft during the last 6 months for comparable homes was $125/sq ft. I looked into the history of the home, and noticed that the owner tried to sell the home in June, 2011, for $315,000, or $141/sq ft. The seller’s Realtor had much better photos (and greener grass) than the photos that now show up. Right now, the home cannot be sold to investors, although it’s not a fixer upper anyway. I personally think the price will have to come down to compensate the buyer for having to replace the lawn at some point, and because buyers expect a deal when buying a foreclosure. It bet the house sells for $270K. Lakeway is full of unique homes, but every once in a while I see one that really catches my attention. The home at 110 Schooner is one of those. I like the big game room, the bathrooms with Travertine and granite, the views, especially from upstairs, and the kitchen. My least favorite part of the home is the entryway, because as you enter the house you’re greeted by a wall which happens to be the back of the fireplace, so it can’t be opened up. But, once you’re past the entry, there’s a lot to like about this house and neighborhood. Lakeway area home on acreage with view! It is difficult to find homes on acreage in the Lakeway area without the price tag going over $500K, so this home, priced at $435,000, really stood out when I saw it last week. Situated on 2.52 acres, the 2865 sq ft home was built in 1998 and has 3 bedrooms plus a study, and 3 baths. I really liked the feel of the home from the moment I walked in the door. The living room is open with big windows to the hill country, panoramic views, and the kitchen is completely open to the living room and dining area. There are two bedrooms and baths downstairs, and one bedroom and bath upstairs. The home is located in the Majestic Hills Ranchettes. Click here to see more, or call Vikki Goodwin, REALTOR, Homes ATX, 512-426-9090, for further details. Yesterday I was out previewing Lake Travis area condos for a client. Here’s what I found. The Pinnacle at North Lakeway is a new complex under construction by Ryland. They are just getting started and need to motivate buyers, so they have some really great prices on their new construction. The models are beautiful and they have 2 units just about complete, another 2 that will be ready in about 6 weeks, and more that are getting started. There are 3 floor plans to choose from and some will have nice views, especially from upstairs windows. The condos are set within a large single-family residential neighborhood that should be a desirable place to live. Since they are just getting started, construction will continue for some time, which can be noisy and dirty. While the prices in the MLS are good, those are base prices and upgrades will bump the prices up. The sales representative told me 2 units sold last weekend, and he indicated sales are doing well, so they may raise the prices. Another newer condo complex off 620 is the Enclave at Alta Vista built by Toll Brothers. This is a nice neighborhood that is nearing completion, so construction noise and dirt are not an issue. The condos have nice finish out, great views, and all the amenities (pool, club house, gym, tennis courts, etc.). Since the Toll Brothers name carries some prestige, the prices are much higher per square foot. There’s just a few condos still available in this section, but it looks like they are working on another section. A third new construction condo complex is The Vistas at Lakeway – also by Toll Brothers. While this neighborhood is similar to the Enclave at Alta Vista, right now it has no amenities. The prices are slightly lower than the Enclave at Alta Vista, but they are still high compared to Pinnacle. I don’t like the entryway to the neighborhood – commercial that isn’t very attractive. This community doesn’t have as nice a view as the Enclave. I also looked at some resale condos in the Lakeway area, a few in the Courtyard at the Preserve, a few in Lakeway and one in the Hills of Lakeway. One of the condos is a detached condo at 15405 Joseph that is more like a house than a condo. This one features lots of space for the money, and more yard space, too. However, there are no upgrades, and yard maintenance isn’t included in $110/mo. HOA fee. 1) 410 Hummingbird Ln #2 – beautiful finish out, beautiful entryway and courtyard in front, situated right next door to CenterPointe Sales Office which might not appeal to homeowners. I don’t know the reputation of this builder. The living room and dining room are spacious. Nice view from upstairs. 2) 1209 Delsie Dr – too much road noise here and view of commercial building across the street is a negative. 3) 211 The Hills Dr #9 – $151/sq ft is too high even if it is located in “The Hills”. Prestigious neighborhood and nice house, but seems small compared to others. 4) 427 Seawind – interesting, 1970s condo that has been completely updated. Across the street from Live Oak Golf Course. Eclectic neighborhood. I recently showed a number of condos in Lakeway, and my favorite in the low $200K price range was one located in Stoney Creek. The owners have done a wonderful job transforming a 1970’s floor plan into a modern, cozy home. What used to be a small courtyard was covered and converted into the dining area complete with a sliding window from the kitchen and French doors from the family room. The room is so charming it makes you want to sit down and eat to enjoy the ambiance! Since we also looked at another unit in the same complex, we could see what changes had been made to create a more modern look, and it has made a huge difference. Upstairs are three bedrooms, the master which is wonderfully spacious and has two closets, and two fun kid’s rooms – one painted for a girl and one for a boy. Priced at $219K, this condo is a great deal for someone wanting to get into the Lakeway school system on a tighter budget! See more pictures, or call for a showing, Vikki Goodwin, Homes ATX, 512-426-9090.